Welcome to the Ink it! Stamp it! Design Team Blog Hop - we hop every month so be sure to pop back and visit us again! Today our theme is our favourite bundles in the Occasions Catalogue. I always keep my eye out for bundles in the catalogues because they represent great value with the 10% saving. I've used the Magical Day Bundle to create this anniversary card for my husband who remains my knight in shining armour! 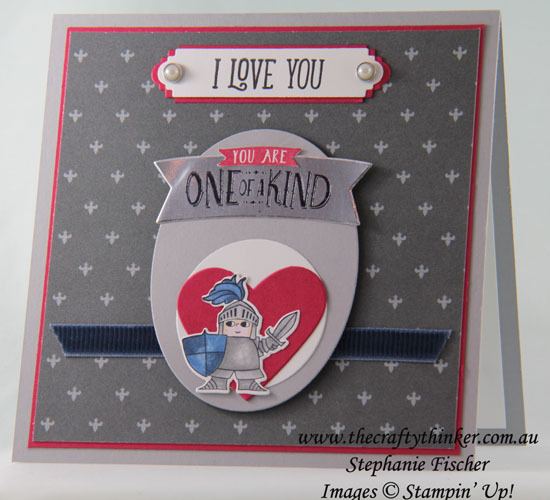 I coloured this particular little knight with Stampin' Blends alcohol markers and cut him out with the coordinating die in the bundle. The greeting on the Silver Foil banner is heat embossed (by tapping the stamp first into Versamark, then onto my Basic Black stamp pad). I cut out the greeting with one of the dies in the bundle and adhered it to the oval. I also stamped the top part of the greeting again with Real Red ink onto Whisper White card and fussy cut out the little banner before gluing it into position. The greeting at the top is from the Happy Birthday Gorgeous stamp set and I cut it out with a die from the Petals & More Thinlits. I then used the same thinlit with Real Red cardstock, cut it in half and adhered to the ends of the greeting along with a strip of Real Red card that I cut 1/8th of an inch larger than the greeting. I had to include some pearls since it's our Pearl Anniversary! The base card is Smoky Slate with layers of Real Red cardstock and paper from the Myths & Magic Designer Series Paper. Thank you so much for joining us today. We hope you'll join us again next month for our 3D projects! I'm Stephanie Fischer and to keep hopping around, see the list below to see who is up next with another great project!